To be honest, the main reason why I got this is that I grew up and went to high-school in this little town east of Cleveland (Mentor, OH). 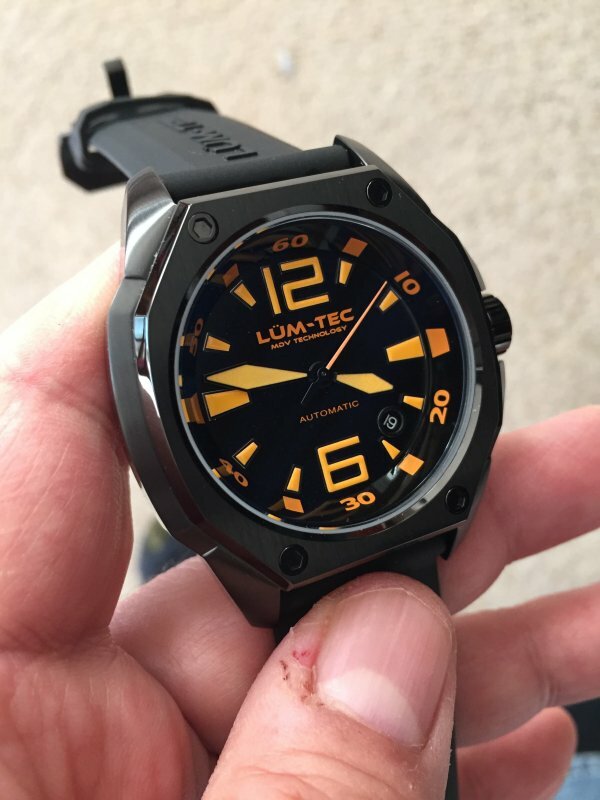 I was blown away to learn that someone has set up a custom watch manufacturing factory there, and uses their in-house brand Lüm-Tec to demonstrate their capabilities. Quick review: this thing comes with two straps (leather and rubber) and a deployant clasp for the leather strap. The leather strap, with matching orange stitching and visible/non-functional screws...is a bit overstyled IMO. It looks MUCH better with the plan black rubber strap (which unfortunately is a bit plasticky feeling). At 44mm x 13mm thick, it's beefy - but not exceptionally so in this day of oversized watches. It has a smaller visual presence, probably due to the thick case, thick bezel, internal bezel spacer (with 5 minute markings) - so the dial itself is similar in size to watches more like 38mm-40mm. The PVD on this model has mixed brushed and polished finish. It's of a type similar to what Glycine uses (or used to use when the Incursore first came out). Sapphire crystal with double-coated anti-reflection both front and rear. The rear also shows off an ETA2824 with matte finish. 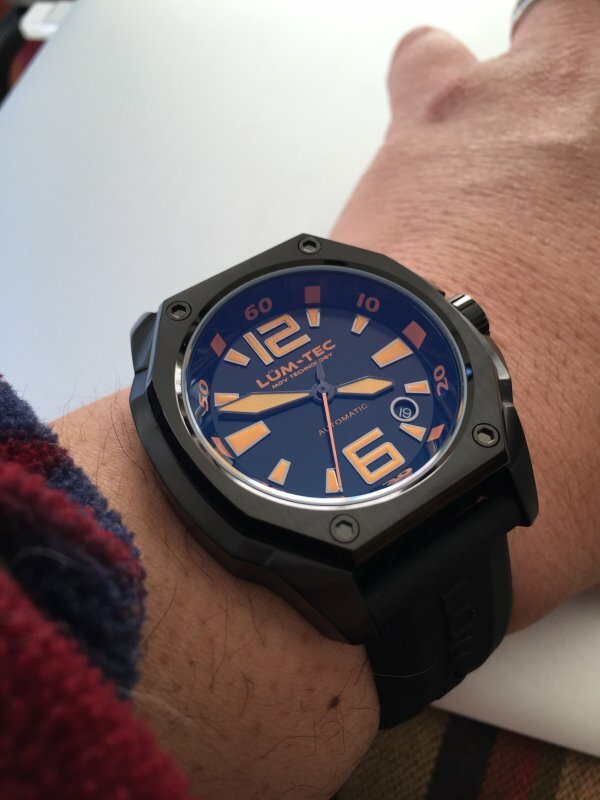 The primary brand selling point of Lüm-Tec is very bright lüm. A quick test shows that, indeed, it does glow pretty brightly. The dial lacks any minute markers, and the bezel doesn't rotate, so even with 100m water resistance, this is no diving instrument. All in all, the build quality is pretty good on this thing - definitely appropriate for the asking price. Sorry, no pics of the lüm yet.